NEW YORK—The National Lawyers Guild (NLG), founded in 1937 as the first racially-integrated, human rights bar association, is committed to ending white supremacy in all its forms. Our hearts go out to the family and friends of Heather Heyer, who was murdered while standing up to racism and fascism, as well as the 19 additional counter-protesters injured at the “Unite the Right Free Speech Rally” in Charlottesville, VA this weekend. As an organization committed to human rights, the NLG categorically refuses to provide legal support to white supremacists or other hate groups. “The Charlottesville community experienced multiple waves of horror this weekend. NLG trained Legal Observers were on the ground watching as those who terrorized our community by fulfilling their promises to enact violence were protected by the city and law enforcement agencies. Our hearts our broken but our chapter is united and resolute in our determination to provide legal support to organizers who will continue to protect Charlottesville,” said Andrew Mahler, NLG Central VA Chapter Chair. While the hateful rhetoric and policies of President Donald Trump and his administration have emboldened racists to assert their “right” to hate speech and violence, the United States was founded in white supremacy—it is nothing new. It is in the spirit of dismantling this oppression that we move forward in the struggle to liberate our institutions, society, and culture. 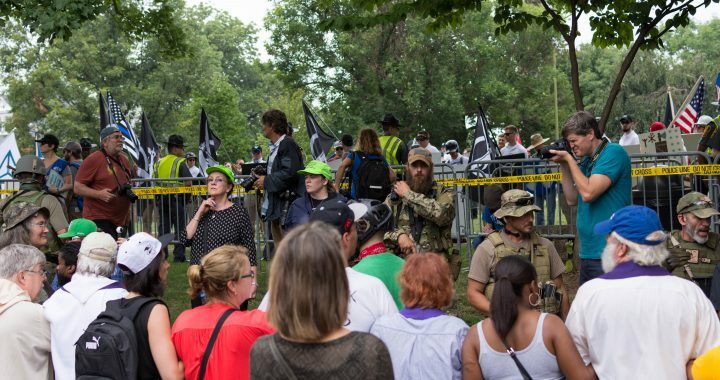 Photo: NLG Legal Observers in Charlottesville, VA, August 12, 2017. Posted in Press Releases and tagged anti-racism, Police, Protest, white supremacy.